2 The Heath Professions Pathways (H2P) Consortium is a nationa consortium comprised of nine coeges in five states that are impementing strategies designed to improve heath professions education. By streamining and enhancing educationa pathways and decreasing time to competion, the participating coeges aim to increase students credentia attainment and empoyment in needed occupations within the heathcare sector. H2P coeges are impementing eight strategies designed to achieve the foowing TAACCCT Round One SGA priorities: Acceerate progress for owskied and other workers; Improve retention and achievement rates to reduce time to competion; Buid programs that meet industry needs, incuding deveoping career pathways; and Strengthen onine and technoogy-enabed earning. The H2P coeges targeted Programs of Study (POS) fa into three career pathways: Therapeutic Services, Diagnostic Services, and Heath Informatics. A tota of 85 POS are being deveoped or have been enhanced as a resut of the TAACCCT grant. The most common POS are within the Therapeutic Services Pathway and are reated to nursing occupations. Refecting the DOL priorities, the Consortium s shared vision is to not ony produce a highy skied heathcare workforce but aso gavanize a nationa movement to dramaticay redesign and enhance heath professiona education and training though nationa curricuar reform, industry engagement, innovative practices and programs, and intensive usage of data and accountabiity systems to ensure student success and program exceence (H2P Proposa, pp. 1-2). In 2013, the H2P Consortium modified its scope of work to incude the production of high fideity, onine earning enhancements for H2P s competency based heathcare Core Curricuum (Priority Four). 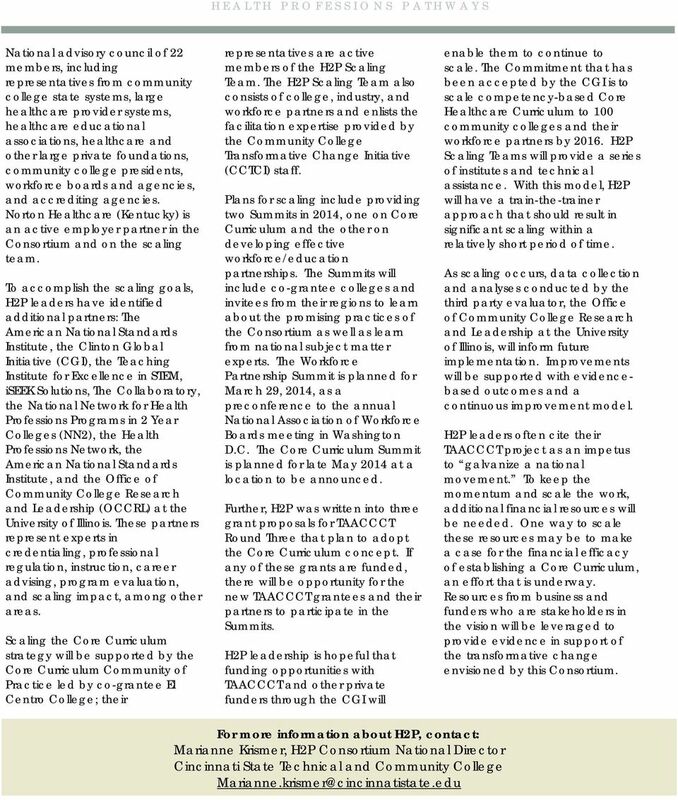 A nine H2P coeges are committed to impement the eight foowing strategies to create new pathways that are deveoped through empoyer, education, and workforce partnerships. H2P eaders describe their mode as a career pathways framework with a competency-based Core Curricuum (Technica Proposa, p. 11). 1. Onine assessment and career guidance H2P coeges proposed to impement onine approaches to Prior Learning Assessment (PLA), empoy onine career advising toos, and enhance career advising services. H2P coeges are using the Virtua Career Network (VCN), an open source patform buit by the American Association of Community Coeges (AACC)that aows users to customize the toos to meet coeges particuar needs and interests. Coeges are aso using the VCN to enhance career guidance so students have another resource to better H2P Coeges Cincinnati State Technica and Community Coege (OH) (ead coege) Anoka-Ramsey Community Coege (MN) Ashand Community and Technica Coege (KY) E Centro Coege (TX) Jefferson Community and Technica Coege (KY) Macom X Coege (one of the City Coeges of Chicago) (IL) Owens Community Coege (OH) Pine Technica Coege (MN) Texarkana Coege (TX) understand their career options in heath professions. Eary evidence based on impementation evauation data from the third party evauators reveas that most of the coeges are using onine career advising toos to enhance career guidance services. However, data were gathered eary in the impementation of most strategies, and at that time there was itte evidence of new approaches for granting students credit for prior earning via the VCN or in other ways deveoped or adopted by the coeges. 6 Heath Professions Pathways The Consortium in this report is a recipient of Round One of the Department of Labor s Trade Adjustment Assistance and Community Coege Career Training grant. 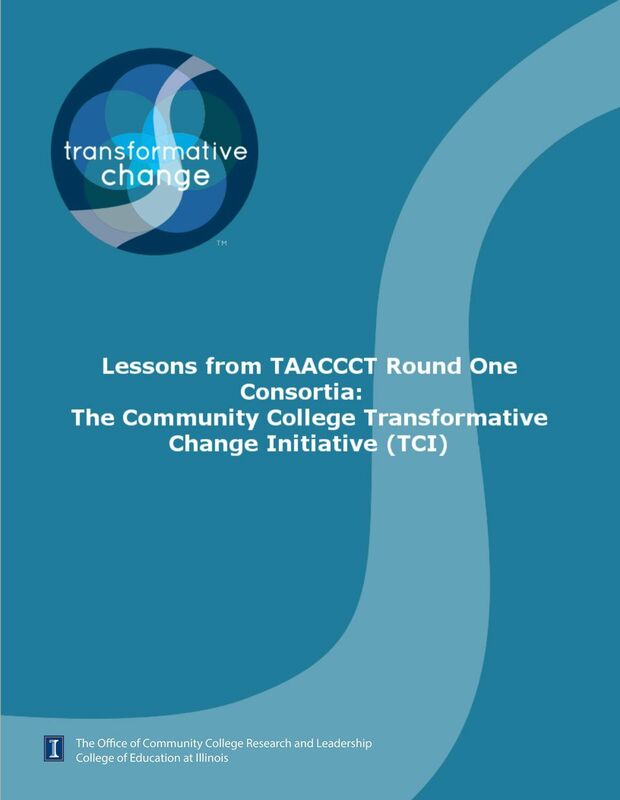 It was seected to participate in the Community Coege Transformative Change Initiative in September To view the other CCTCI consortia profies, pease visit occr.iinois.edu. Specia thanks to the eaders of the eight Round One TAACCCT consortia and to Debra Bragg, Catherine Kirby, Sheey Mix, Deborah Richie, and Aison Witt of OCCRL for their vauabe contributions to preparing these profies. 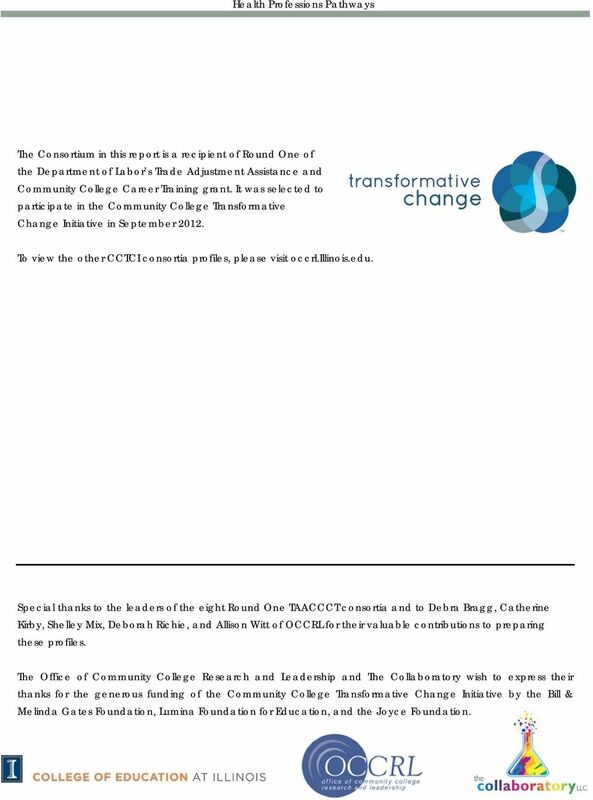 The Office of Community Coege Research and Leadership and The Coaboratory wish to express their thanks for the generous funding of the Community Coege Transformative Change Initiative by the Bi & Meinda Gates Foundation, Lumina Foundation for Education, and the Joyce Foundation.